When choosing an auto transport company, one must weigh all their options. Do you sacrifice customer service and top notch treatment for price? Is certainty and time worth more than price and a higher likelihood for frustration? When it’s time to car shipping companies, it’s easy to see why so many dealership, fleet and private customers choose Fisher Shipping. Here at Fisher Shipping our number one goal is to leave a lasting impression and we give customers many reasons to choose us. We keep our customers satisfied by fulfilling their orders swiftly, professionally and reliably. You will be assigned an account manager who will personally handle your account from dispatch to delivery. Give us a call; you can always reach an office employee 7 days a week until 9pm est. We understand how the auto transport industry works, and we will make it work for you. Fisher Shipping offers our dealership clients a dependable auto transport option combined with competitive pricing and one stop shopping. 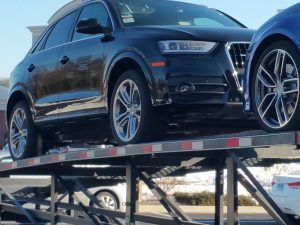 We want our clients to know that there is an auto transport company that takes as much pride in transporting your vehicles as you do in selling them. We love what we do and are confident that we do it better than all of our competitors. Fisher Shipping’s extensive experience in the transport industry for years accounts for our unique perspective and realistic expectations. We boast an impressive portfolio of large, profitable and renowned customers. Customers have come to cherish our abilities in handling all sorts of technical issues. Our client-centered focus is based on our commitment to maintain our flawless reputation. We don’t believe in voicemail: Instead of having to leave endless messages about shipping your vehicle, you’ll speak with a real, live human being every time you call between 9-5, E.S.T. Insurance matters to us: In addition to having lofty requirements for the trucking companies that we partner with, we also carry a $500,000 contingent cargo insurance policy. After-hours service: Reach our staff every evening, 7 days a week until 9pm E.S.T. Knowledge & experience: We have moved over 100,000 vehicles since opening our door in 2006. The Fisher family has been transporting vehicles since the 80’s. Real prices: We don’t add on charges to our price for things like insurance, door to door service, or fuel surcharges. Unlike others, our price is all inclusive and will get the vehicle shipped when you expect it. How we calculate cost. Top quality carrier network: Unlike other car shipping brokers, we have high expectations and hold our carriers accountable. We know who to work with and -more importantly- who NOT to. Why does this matter? Enclosed vehicle transport available: If you are moving a classic, rare or high value vehicle, ask about our enclosed vehicle shipping rates.